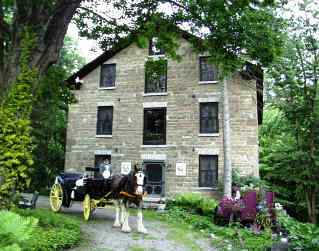 The stone Grist Mill was used as a station of the Underground Railroad. Travel to and from the mill was through an underground tunnel that ran along the creek to another Mill downstream. The 1835 Stone Grist Mill and Emporium/Ice Cream Parlor, 1894 Mill House, 1888 Hog'n Haus Cottage, HillSide and CliffSide Cottage are located in a tranquil park-like setting near cascading waterfalls, herb and perennial gardens. Our gardens have been planted with over 21,000 flower bulbs as well as thousands of herbs and perennials. There is always an inviting place to stroll or pause in this peaceful haven. The INn offers richly decorated rooms all with private baths. Enjoy our soothing outdoor Hot Tub Spas at the Stone Grist Mill and the CliffSide Cottage both overlook the natural gorge and cascading waterfalls. You might even view the deer feeding in the forest just across the gorge. A deluxe continental breakfast, homemade pastries as well as complimentary gourmet desserts and our ice cream parlor are available 24/7. Wireless High Speed Internet. Enjoy playing Pool or listening to storytelling in our museum-like Emporium. Relax by the Old Mill Stream in a hammock, a covered swing or meditate in the Zen Garden. Dine in many fine restaurants located close by, one is even a Haunted Castle. Located within the Mohawk Valley Heritage Region of Central New York, in the Town of (West) St. Johnsville. Situated just above and close by the Mohawk River and Erie Canal near the St. Johnsville Municipal Marina and North of Cooperstown. The following list includes links that will give you more information..